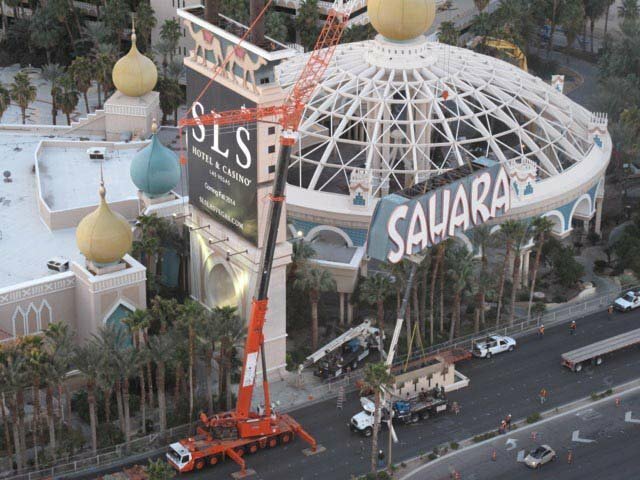 The SLS, which sits on the northern end of the Las Vegas Strip where once stood the legendary Sahara, may be going back in time, at least as far as branding is concerned. The beleaguered casino property, which has already tried a multimillion renovation and bizarre modern art greeting arriving guests from its circular outdoor entry, is looking for anything to recapture its former glory. When the SLS, standing for the home-shopping-network-sounding moniker of “Style, Luxury, Service,” opened its doors in August 2014, it heralded what appeared to be the comeback of a post-recession Las Vegas Strip. 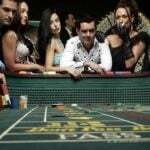 But just a year after opening under the auspices of partners Stockbridge Capital and SBE Entertainment, the new casino hotel had failed to turn a profit. Even after switching out restaurants and entertainment venues, customers (possibly scared away by the now-infamous “Blob” statue out front), were not flocking through its doors. The reasons behind the flop were multifarious, but started at the top with then-owner Sam Nazarian, the guy who thought the Blob would be a compelling draw. After failing a Gaming Control Board-ordered drug test and admitting to giving purported extortion money in the millions to an ex-con who claimed to have been his former business partner, Nazarian was forced to step out of his key role at SLS. But that was just the beginning. Food and beverage, typically a moneymaker, cost the casino $5 million in losses that year. It became evident that no matter how hip Nazarian had tried to make the place, it couldn’t overcome that classic real estate issue: location, location, location. Surrounded by other demolished properties, including the still-unfinished Genting Resorts World Las Vegas and Fontainebleau, and the former Riviera, which is to become part of a new Convention Center, SLS stands as a kind of lone wolf in a sea of yesteryear’s memories and tomorrow’s confusion. Given the latter, the former is looking like a more and more attractive option to revert to. 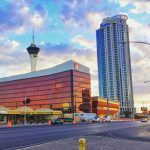 The Meruelo Group, a California holdings company that invests in construction, engineering, media, food services, and hospitality and gaming, agreed to acquire SLS in May for an undisclosed price. 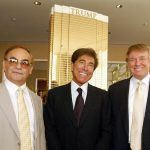 The deal is expected to be completed in the third quarter of 2017, and once executed, the new owner is reportedly considering reverting the building back to its Sahara name. The original Sahara stood on the Strip from 1952 until its 2011 closure. At the time, it left the Riviera (since closed), Tropicana, Flamingo, Caesars Palace, and Circus Circus as the only pre-1970s Strip casinos still in operation. Opened in 1952 by developer Milton Prell (who was not connected to the bright green shampoo brand of the 1960s) and sold to Del Webb nine years later, the Sahara was a Rat Pack hangout, and frequented by many celebrities, including Judy Garland, Jack Benny, George Carlin, Bobby Darin, and Sonny & Cher.